"I don't have any children, so I've decided to claim all the future freedom-fighters and hell-raisers as my kin," wrote journalist Molly Ivins. 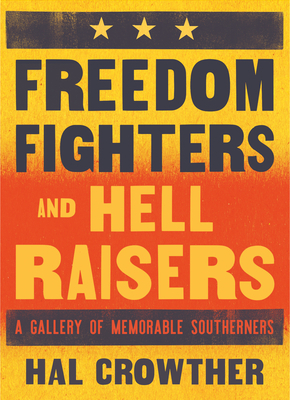 Ivins is one of the biggest hell-raisers profiled in this collection of essays by Hal Crowther, but there is plenty hell-raising and freedom-fighting to go around. Crowther is a writer whose own career is marked by sharp political and social commentary in the pages of national and regional outlets, from Time to the Atlanta Constitution to The Oxford American. In this collection, he turns his attention to best and the brightest of the recently departed generation in the South. These essays commemorate the passing of iconic Southern figures such as John Hope Franklin, Doc Watson, Judy Bonds, and James Dickey. Crowther has known most of the folks he profiles and has lived in their particular landscape for decades; he has some stories to tell, and he does so with a particular appreciation for his subjects' accomplishments, their surroundings, and even, in the case of politicos Jesse Helms and George Wallace, their particular brand of notoriousness. Novelist and commentator Silas House, author of Southernmost and A Parchment of Leaves, introduces the collection. Hal Crowther is an award-winning critic and essayist, a journalist whose work has appeared in Time, Newsweek, Granta, and Narrative magazines, among many others, and in the Oxford American, where his column "Dealer's Choice" was a finalist for a National Magazine Award. His columns and reviews have been published in the New York Times, Washington Post, Atlanta Journal Constitution, Spectator, and many independent weeklies and journals. A recipient of the Baltimore Sun's Mencken Award for Writing, he is the author of four essay collections and An Infuriating American: The Incendiary Arts of H.L. Mencken. For his third collection of essays, Gather at the River, he was a finalist for the National Book Critics Circle prize for criticism. He lives in Hillsborough, NC, with his wife, novelist Lee Smith.